Cast from found twigs, Nancy Nelson's delicate design is made for the giving tree in your own life. Researchers have found that mature "mother" trees can connect to their nearby offspring to give them more room and resources. Nancy Nelson's sweet necklace is made for the giving tree in your own life—she turns twigs from West Virginia woods into two infinity symbols, casting the larger in sterling silver and smaller in brass. 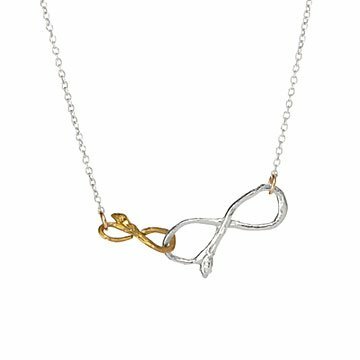 Timeless and delicate, it's a lovely tribute to everlasting love. Handmade in Maryland. Even lovelier than the picture. It's a beautifully wrought necklace with an equally meaningful story.